Master Chan Ka Wah was born in Guangdong Province, China in 1939 and moved with his family to live in Hong Kong in 1949. He began learning Hung Kuen Kung Fu at the age of 15 from Ho Lap Tin and still teaches at the Kwoon (teaching since 1957) even after Ho Lap Tin’s death in 1985. Master Chan Ka Wah during his career went to Singapore to compete in a traditional Kung Fu competition in 1969 and won “Rearguard” (fourth overall in this international competition). He remains a member of the Ho Lap-Tin Kwoon to this day and resides with his wife in Tai Wai, New Territories Hong Kong. 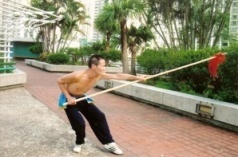 He still teaches traditional Hung Kuen Kung Fu from the roof top of the local shopping centre.